Paul Cameron (center) on the Westworld set. 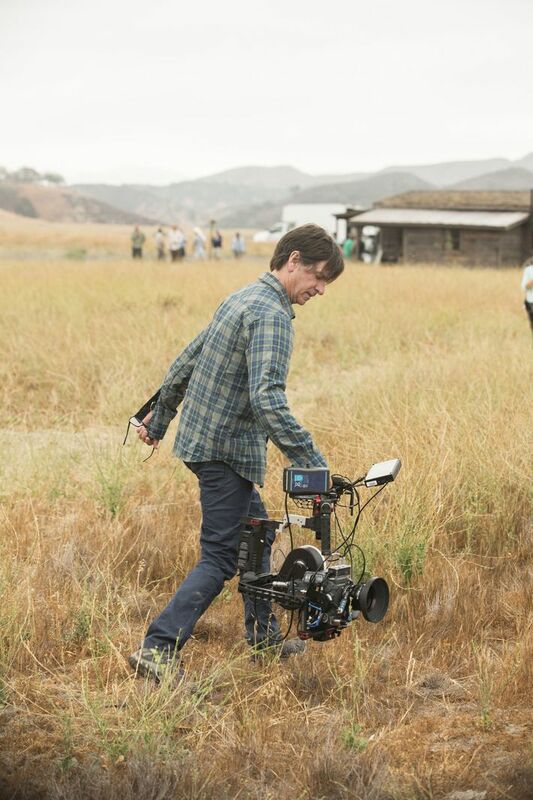 In his work shooting Marlboro commercials alongside the late Tony Scott, cinematographer Paul Cameron brought a quick-cut, hyperstylized look to the American West. 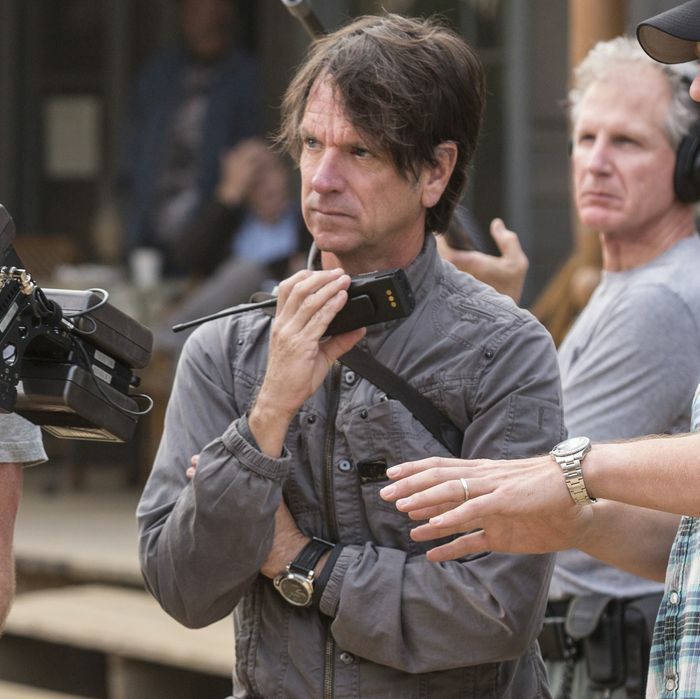 For Sunday night’s Westworld pilot, though, he slowed things down: As Cameron explained over the phone a few days before the episode aired, he and director Jonathan Nolan (who also co-created the series with wife Lisa Joy) took inspiration instead from the iconic Westerns of John Ford. But Westworld isn’t just a Western; it’s also a sci-fi show, set an indeterminate number of years in the future. Cameron revealed how, amid the production’s classical Hollywood tricks, they also sought to bring a sense of mechanical paranoia to the show. What were your original conversations about the look of the show like? When I met Jonathan, I could tell pretty quickly that I was very interested in doing a project with him. We talked about shooting on 35mm film, the scale of the project, his hopes and expectations. I knew quickly from that early meeting what kind of scale he was going for. Why was shooting on film so important? Film, for me, is always the preferred medium. It’s very elegant. It took it a hundred years to perfect it, and it’s absolutely fabulous. It renders skin tones and faces incredibly well in a very naturalistic way. You couple that with some great Cooke lenses and you have a very nice, cinematic feel. Film’s also like riding a horse, it takes a certain discipline: You’re matching with your eye through the eye piece as opposed to seeing footage on a monitor. Mr. Robot’s cinematographer was singing the praises of Cooke lenses, too. They render roundness and shape well, which is fabulous for faces. And they’re relatively distortion-free on lines, which works for landscapes. They have a slightly soft quality, beautiful flares — just a classic, timeless piece of glass. How much inspiration did you draw from classic Westerns when shooting the Westworld scenes? It’s part of a bigger process. Jonathan and I studied a number of John Ford films, but it wasn’t about making direct visual references to Westerns. It was more about how to incorporate the feeling of the classic Westerns, that vastness of landscape. Part of that was in the location scouting. Moab and Dead Horse Point were two locations where I’d shot a lot of Marlboro commercials with Tony Scott, so I was very familiar with the terrain — the red rocks and the Colorado River. During filming we came up with the idea of bringing the set walls to the actual locations for reverse angles. You shoot a scene looking one direction, and then when you swing around to the reverse shot, you’re looking out the windows and it’s actually the real park. In the scene on the balcony in the operations center, the angle looking towards the characters is at the Pacific Design Center in Los Angeles, and then the reverse angle is at Dead Horse Point at dusk. Same with the scenes with James Marsden arriving in the town every day: We brought that train out to Moab and drove it up and down the highway, with the real background. It’s an old classic way of doing it. We didn’t want to do it with special effects. You definitely get a sense of that in the horseback-riding scenes. Traditionally we might have shot those scenes on Bureau of Land Management land, but recently there have been a number of restrictions on the property in terms of where you can gallop horses, where you can put cameras, how long you can bring helicopters, etc. Fortunately, I knew of private land, a place called Harley Bates Ranch just outside of Moab, where we were able to track alongside on what we call a pursuit car, which has a robotic camera arm. We can track with the horses and we can also bring in aerials and do very low, fast counter shots of the riding. I’ve done a lot of that stuff before, so it’s all very easy to coordinate. Having a private piece of property to do it on makes it all go very fast. What kind of look were going for with the backstage scenes in the control room? It was a combination of the starkness of 2001 or A Clockwork Orange for the upper floors, and then the bottom floor is Slaughterhouse-Five. We wanted to feel like there was a certain kind of timelessness to the operations center. When you watch this ten years from now, it’s still going to feel familiar. In the show, the operations center is 17 floors: there’s manufacturing, there’s the diagnostic center, there’s the behavioral center. That’s actually all done on one set that gets recycled. It’s probably 100 by 60 feet, and it’s all glass walls. It’s a fabulous idea except that, if you can imagine, when you turn on a light, it’s like having 500 mirrors. You see every single light, every single reflection. But with help from the production designer, we were able to put this kind of concrete ceiling above the set, and behind it I could have the lights repositioned very quickly, with diffusion that come straight down through the ceiling. We wanted to add an element of mechanical camera moves to everything, to give the shots this robotic feel. We tried to keep it very subtle, but you’ll see, even in aerial shots, it might be tracking along and you’ll just see this definitive pan left for no reason whatsoever. Or on the ground, if we were doing a Steadicam shot, it would be a very forceful pan left or right, or go up or down in a particular moment. The concept of these camera movements is that they’re done in the back room where the characters are watching the 3-D map of the park, and operating cameras to watch the characters in the park. A show’s pilot often sets the visual tone of the rest of the episodes of the series. Is there any particular aspect of the look you’re hoping future DPs will pick up the mantle for? The pilot episode is kind of a small rule book. I know that there were upwards of an additional five DPs on the show through the season for scheduling reasons. And from what I’ve seen, they kept a very consistent look all the way through. Of course every DP is going to add a little of their own style here and there, but you can see in the footage they kept the basic color and tone and camera movements. It’s just a very elegant, simple style that a lot of DPs are happy to follow up.